A walk in bathtub is a bathtub that is designed for you to literally walk in to. 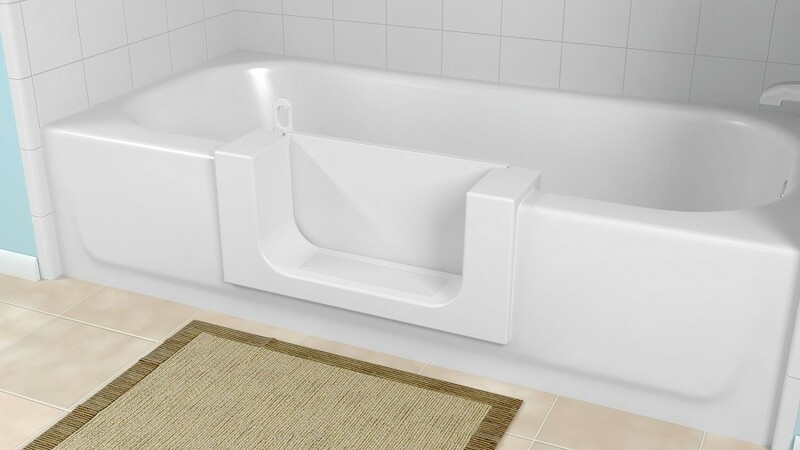 The purpose of this is for those that have trouble climbing in and out of the traditional bathtub style, eliminating much of the hazards of slipping and falling. This is accomplished with adding more vertical elements to the bathtub design instead of having more horizontal space as with a normal bathtub. Walk in bathtubs usually contain footholds and handlebars and many feature seats so that you don’t have to stand while bathing, placing less pressure on your legs. Who are Walk in Tubs for? Walk in bathtubs are great for those that have weak knees or problems standing for long periods of time as many of these are built with seats. This extends doubly over as the primary reason for these bathtubs to exist is to assist both the elderly and any disabled individuals. With the design of these bathtubs, anyone can easily enter into the bathtub with the assistance of guide rails and steps without fear of tripping and falling on slippery bathtub surfaces. A standard bathtub has a max depth of 13-14 inches whereas walk in bathtubs can have nearly 40-48 inches of water depth. Seats are placed 17 inches above, leaving nearly almost 20 inches of depth to immerse yourself in water. This depth also pays off as many models of walk-in bathtubs have hydrotherapy jets as well as heated seating options. The primary focus of these bathtubs is to lessen the dangers of falling in the bathtub, especially for individuals over the age of 65. This is accomplished by including built-in handrails, anti-slip flooring, steps and contoured seating. All this combined with a low height for entry means less area for you to potentially fall and hurt yourself. Where as many bathtubs on the market really offer a handful of features, walk-in bathtubs enjoy a plethora of additional features such as add-on handrails, anti-scald valves (highly recommended), built-in seating and non-slip flooring all in one package. Although it may seem hefty at first, a walk-in bathtub is a great deal more affordable than purchasing all of these features separately and trying to add them to an existing bathtub. As this bathtub has you immersed in water from a torso height, it’s quite similar to a hot tub. Warm water has numerous health benefits for aches, pains and can even ease the pain of burns or ulcers. With the design of walk-in bathtubs, many are fitting with jets that provide hydrotherapy which can help massage and relax the body further, promoting better muscle health long term. The primary negative of walk-in bathtubs is that there is no active way to control the water temperature. With traditional bathtubs, you simply turn on the hot water to fill the bathtub, and come back when it is full. If it is too hot, you simply wait for it to cool before jumping in-which is not a large hassle. With the design of walk-in tubs, this process is a little different as the water doesn’t turn on until the occupant is seated inside and the door is closed. This means that it can take several minutes to adjust the temperature from scalding to normal. This is why it is highly, highly recommended that you install an anti-scalding valve to prevent any unfortunate accidents from occuring. Similar to temperature is the discussion of how long walk-in bathtubs drain. Most bathtubs drain their water in between a time frame of 3-5 minutes. Walk-in bathtubs can take up to 15 minutes to drain due to the small area of which the water escapes. Even with some higher end models that have more accelerated drain functionality, the process still takes around 8 minutes, leaving someone exposed to the cold as the bathtub fully drains before they can exit. This also creates a small danger of flooding as this bathtub typically fills higher than the door height, adding in the possibility of spilling excess water if not careful. Walk-in bathtubs carry a multitude of great features, but this comes at a hefty price. Most are typically very large, meaning that your install costs are typically going to be quite high. In addition, many of these bathtubs already have a relatively high price tag between $1,000-5,000 not including installation. Depending on the size and complexity of your installation, you can easily hit $10,000 if you’re not careful, just for a bathtub installation. On the small spectrum, a walk-in bathtub starts at around $1,000. This price point usually has your most basic functions such as handrails, and anti-slip flooring, but any additional features such as heated seats, hydrotherapy jets and anti-scald valves will most certainly raise the price. For the model that contains the vast majority of additional features, you are looking at a price point between $3,000-5,000. Your overall price point will fluctuate between size of the bathtub as well as which features you wish to include, though if may be more pertinent to purchase the other features later and install them yourself. Standard space for a bathtub is 60 inches long and 32 inches wide. A walk-in bathtub can fit anywhere in that spectrum depending largely on your needs. The smallest size for a walk-in bathtub is around 36 inches long and 32 inches wide, with the larger sizes going to 60 inches long, 32 inches wide. Of course there are plenty of bathtubs on market that can go to 72 inches, but most usually fit this spectrum unless custom built. The water depth for a walk-in bathtub should sit anywhere between 3-4 feet. A shower bathtub combo is a flexible design, allowing you to take any existing bathtub and simply add a shower attachment, some curtains or doors, and you have a shower bathtub combination, giving you more flexibility in your bathing. Of the two, the shower, bathtub combination is easily more flexible in both price point and function as it gives the option for quick showers or long baths all in one more digestible price point as the many of these can be put together for under $500. For many, a shower bathtub combination is going to be the more practical choice as the negatives of a walk-in bathtub is one of time and flexibility. Walk-in bathtubs have only one method of bathing and it is a fairly time consuming one at that. Their purpose shouldn’t be understated however, as they are well-designed bathtubs, but if you don’t have elderly or disabled individuals in your home, a walk-in bathtub is not recommended. How long does a walk in tub last? With proper maintenance, a walk in bathtub should last anywhere from 10-15 years depending on the material used. Fiberglass will typically curb around the low end of the spectrum, lasting 15 years at the max, where as acrylic will have a much longer shelf life, floating between 25-30 years easily. The difference with walk-in bathtubs compared to other bathtubs is that not all of the surface area is used during bathing, meaning there may be build up and erosion on areas that are not immediately visible to you, so be mindful of this moving forward as these bathtubs are not cheap. Since walk in bathtubs are quite pricey, an important question is if they are covered by Medicare or similar insurance and are they tax deductible. Since walk in bathtubs can be used by nearly anyone, they are unfortunately not covered by medicare as they are not considered to be ‘durable medical equipment’ unlike hospital beds, nebulizers, catheters and wheelchairs. So if you want a walk in bathtub in your home, you need to pay for it through your own means. They can be tax deductible however if you purchased your walk in bathtub with the intent of medical safety, you can most certainly claim it as a medical expense.